This past summer I did a blog post about Hallmark Cards licensing my work for the second time. Well, it's happened again! 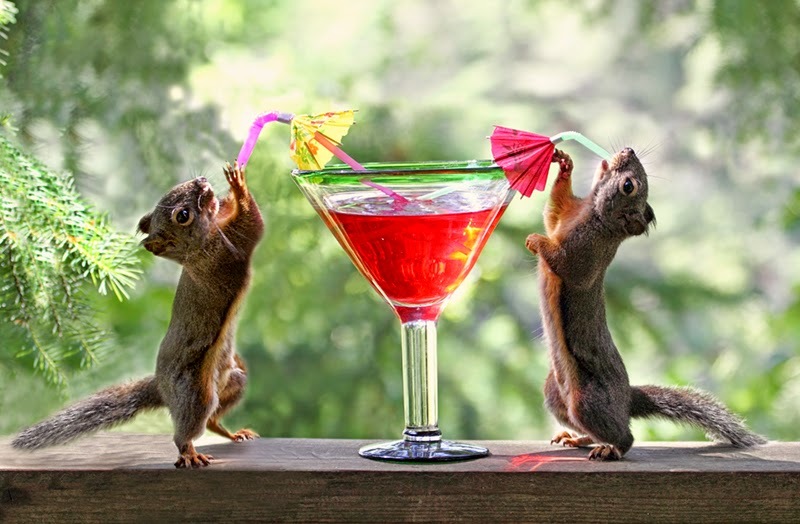 Apparently they like partying squirrels over at Hallmark because they've now licensed my shot of Tipsy and friend enjoying a cool beverage out on the back deck. So hopefully you'll be seeing greeting cards of my Happy Hour squirrels on the shelves soon. Cheers! Labels: squirrels "happy hour" "cocktail hour" "hallmark cards"
You asked a question on Bob's site - what do fulltimers do to fill their time? I'm a fulltimer - 4 1/2 years now - and we do pretty much what we did at home on a weekend or vacation time. If you are a creative person, you'll probably still enjoy doing that. If you are a TV watcher, you'll do some of that. If you love to read, you'll have lots of time for as many books as you want. I love my computer and spend a lot of time in front of my laptop. I brought some of my craft materials and sketching/card-making supples with me - haven't used them in all this time. Only the Hallmark card program. I doubt you'll be bored. Of course, if you are bored now, you probably will be bored on the road, too. There are still chores - cleaning the kitchen and bathroom, dusting, vacuuming, washing the windows. Walking the dog. Shopping, laundry, getting gas and propane in town. Three meals a day have to be planned and prepared. I was bored only once - and I told myself to get real and find something to do. Thanks for your comments, Barbara. Yes, Hallmark I haven't tried their Card Studio but will look into it. The license is for greeting cards and e-cards, so maybe it'll be a part of the card studio as well. I'm rather attached to my laptop too and would have to figure out how to do my many online activities while on the move. I think Bob probably has this kind of info on his blog but I haven't investigated yet. When we've gone camping in the past, we leave all that stuff behind and then I'm at a bit of a loss as to what to do with myself. Let's just say that the dogs get a whole lot of walking! But if I were to make it a lifestyle, I'd have to be hooked up to my computer because I have three online shops that need tending to. My husband is retired now though so he can just relax a little!